The story of Proyecto Escape begins with a walk taken by urbz Colombia team through one of the many conurbations of Bogota in January 2016. 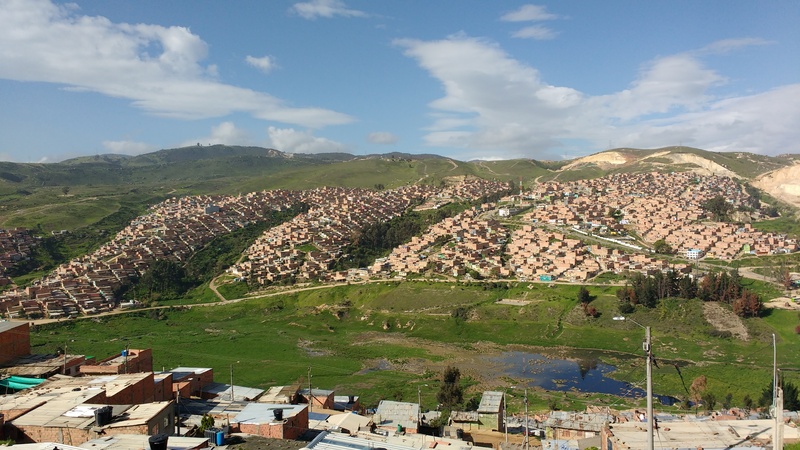 Specifically, the team walked along the historic route from Ciudad Bolivar into an area known as Cazuca in a different municipality called Soacha. 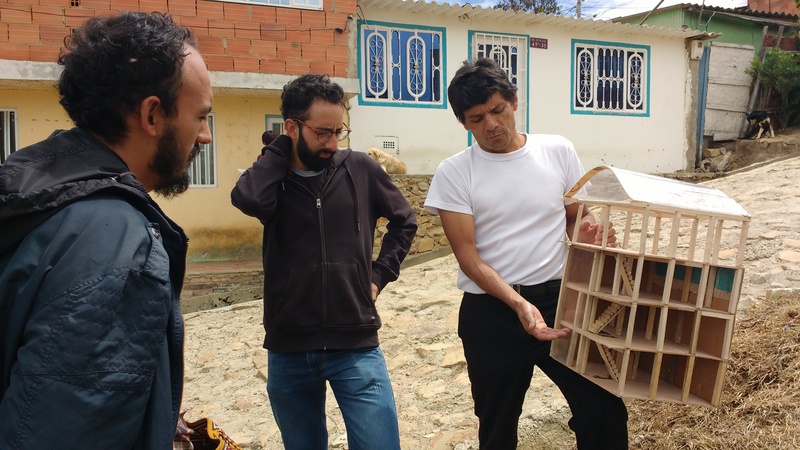 It is while wandering in the neighborhood of Altos del Pino that they encountered Nohora and her husband Miguel (Proyecto Escape) who expressed their desire to build a Community Cultural Center there. 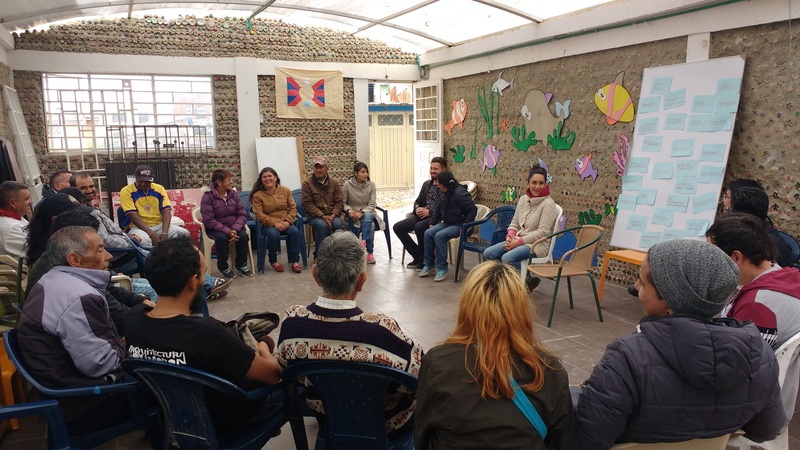 Initially, urbz decided to organize workshops with the help of the couple and members of the community and began articulating methodologies and processes for the same as a representative of urbz Colombia and C-PAUC. It was in March 2016 that Arquitectura del Oximoron joined the cause as the principal design collective for the project. 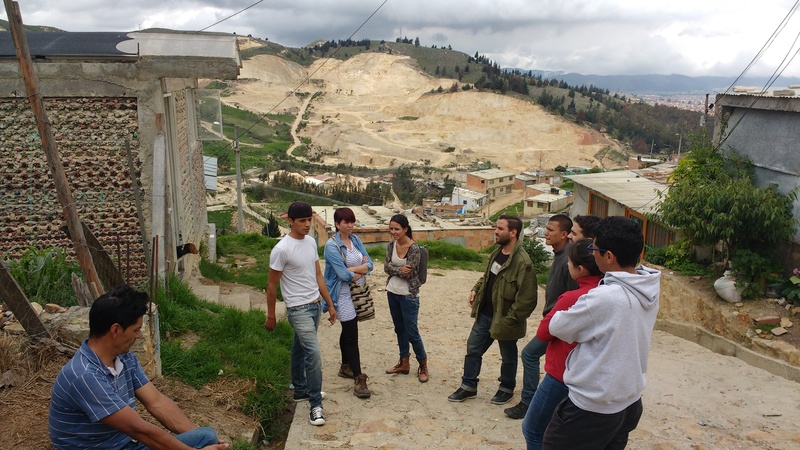 Along with them, urbz Colombia initiated programs to engage the residents and to understand the neighborhood better. Parcours (Walkthrough) through the community spaces were organized and social mapping done. The residents were shown various references in order to help them imagine more for their center as well. These activities helped formulate the groundwork for an intervention. 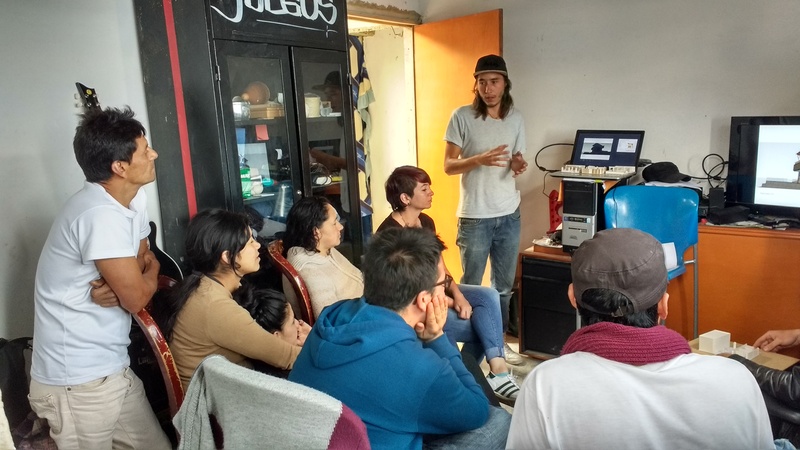 It was only in March 2017 that several other actors joined in to help organize workshops, which included the Observatorio Urbano Habitat, LAB LAHC , which is a dedicated cell of the Universidad de La Salle, Colectivo Semillas, a team from Costa Rica, and Nostoc. 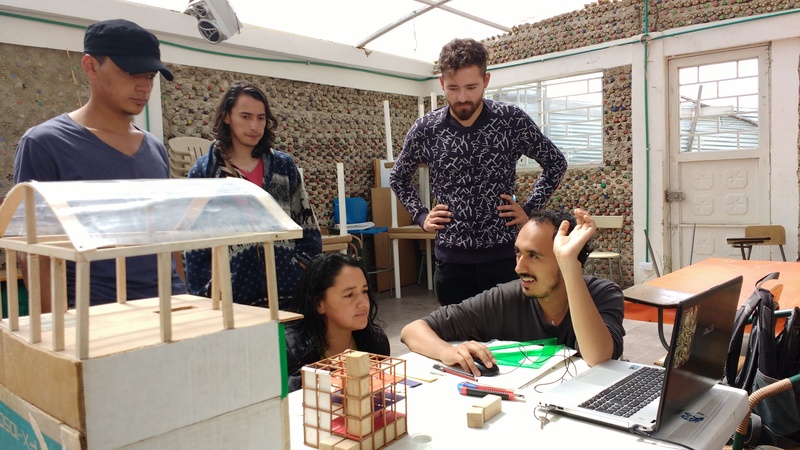 These agencies along with urbz Colombia, C-PAUC and Arquitectura del Oximoron organized the first Workshop in Emerging Architecture and Urbanism in May 2017 where the concept of “Celula Restaurativa” gained physical form. 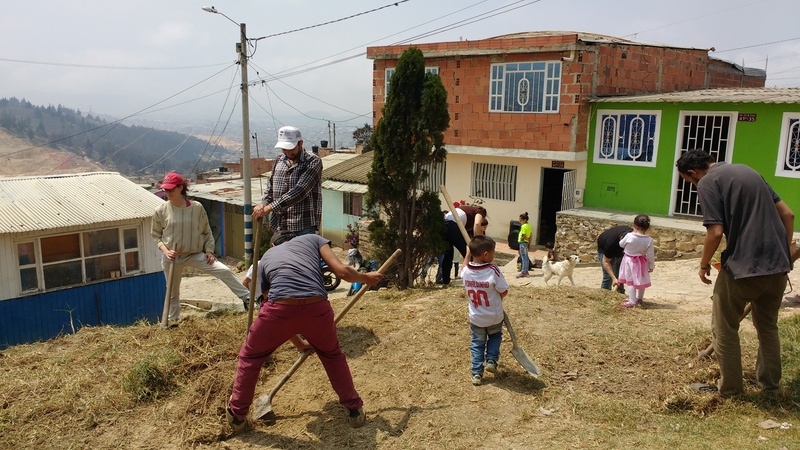 In the first "Workshop of Emerging Architecture and Urbanism", the construction of a Restorative Cell in order to promote restoration at a social level in an urban landscape was carried out. The workshop aimed to transform the way environmental awareness is generated so that it leads to social integration with a greater sense of responsibility and appropriation for the territory among the people. The Restorative Cell is a place for construction of an urban agro-ecological garden and a nursery of ornamental species that are also functional. The aim was to improve the urban landscape and generate awareness about the importance of caring for and conserving the ecosystem that surrounds us, through simple plantation of varieties that attract birds, fruit bearing plants and vegetables; ultimately strengthening the community. Guiados por el colectivo Oximoron, se reune a varias personas de la comunidad, principalmente ninos y se organiza un taller sensorial del territorio para luego aterrizarlo en la propuesta de imaginarios para conocer y entender aquellos ideales que la comunidad tiene sobre el area de intervencion. Mediante fotografias panoramicas de varios sectores del lote y recortes con mobiliario y personas se construyen poco a poco estos imaginarios que reflejan la visualizacion de las personas sobre el espacio luego de haberlo percibido mediante sus sentidos. Guided by the Arquitectura del Oximoron collective, several people from the community, mainly children, met and a workshop involving a walkthrough of the neighborhood was organized to know and understand the ideas that the community has for the site of intervention. Through panoramic photographs of various sectors of the lot and small installations with furniture, the people gradually built “imaginaries” that reflected the visualization that people have of the spaces after having perceived through their senses. 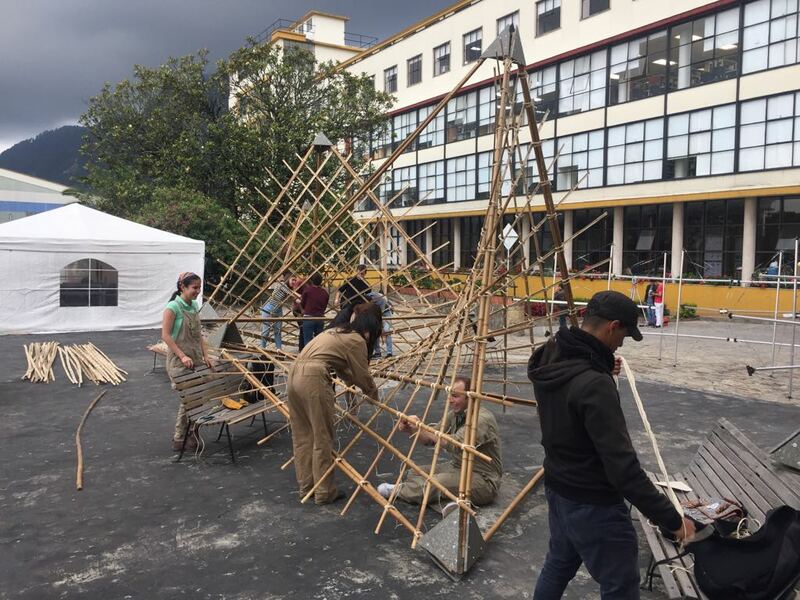 De la mano del Arquitecto Carlos Nader, se realizo en la Universidad de la Salle un taller de estructuras de facil ensamblaje basadas en la geometria de los tetraedros con animo de comenzar a visualizar geometricamente la celula restaurativa a traves del futuro habitar de la estructura. 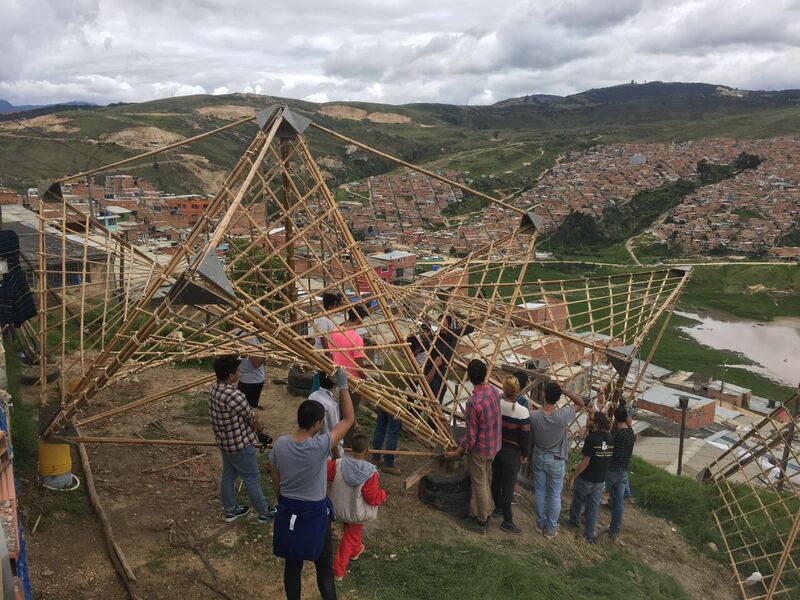 With the help of the Architect Carlos Nader, a workshop of easily assembled structures based on the geometry of the tetrahedron was held at the Universidad de la Salle with the aim of starting to visualize the restorative cell through the future inhabitants of the structure. La construccion del modulo busca reforzar las actividades de tipo ambiental y pedagogicas cuales promueve el Proyecto ESCAPE en su comunidad. 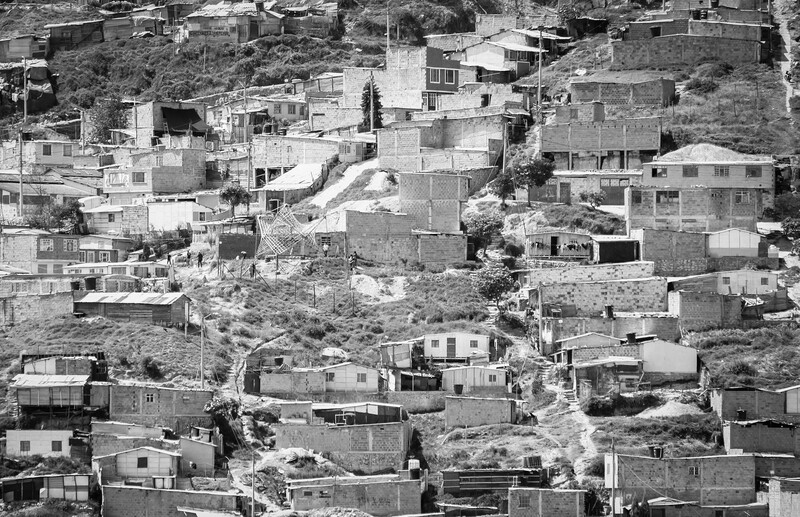 Busca ademas incentivar y generar un espacio donde se realicen practicas que busquen la restauracion del territorio a traves de diferentes activadades. 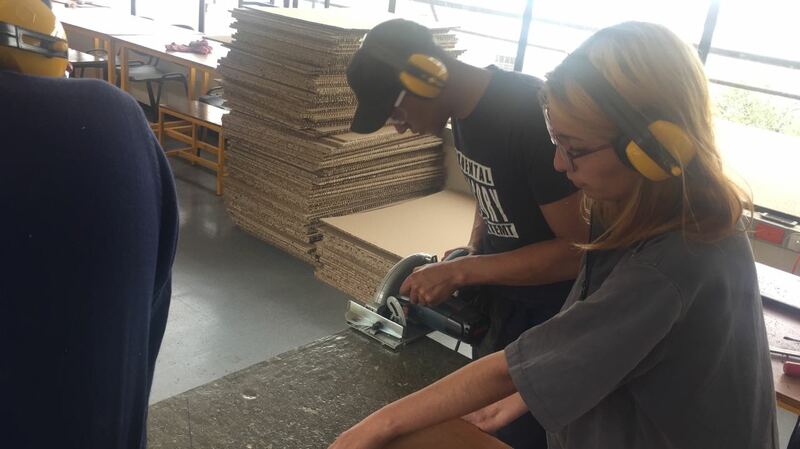 The construction of the module seeks to reinforce the environmental and pedagogical activities that Proyecto ESCAPE promotes in its community. It also seeks to encourage and generate a space where practices that seek the restoration of the neighborhood are carried out through different collective activities.